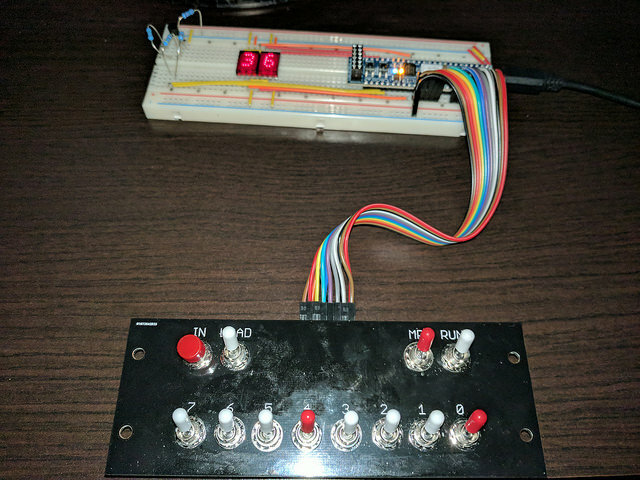 Second breadboard prototype | What's All This Brouhaha? Since my PCBs aren’t likely to be here before Tuesday evening, and I’ve abandoned the 5×7 matrix LEDs, I’ve had to throw together a second hardware prototype using the HP 5082-7340 hexadecimal LED displays. In this photo, it is running a hardware test using a Xilinx MicroBlaze soft core, rather than my 1802 core. I’ve tested the LEDs, but have not yet tested the switches and composite video output. I’ll test those tomorrow, then switch to my 1802 core. I can’t believe how well fingerprint smudges show up on the switch panel. Yuck! I’m not bothering to clean this one, because I’ll have the new rev of the switch panel when the new PCBs arrive.